I had a terrific authors weekend. I told Jim it's my kind of happy hour when I get to listen to an author speak for a while. And this weekend, I had the chance to hear Elizabeth Gunn, Mary Anna Evans, and James Sallis. Friday afternoon, we had Elizabeth Gunn at the Velma Teague Library. I had written to her years ago when her first Jake Hines mystery, Triple Play, was published. At the time, I lived in Ft. Myers, FL, and she wrote back that she was so pleased to have a fan in Ft. Myers. I found Jake to be an intriguing character. He was a police detective in Rochester, Minnesota. He was also a foundling, who had no idea who his parents were, although he was of mixed race, and looked unusual in Minnesota. Over the years and the books, Jake has grown in his relationships with others, his knowledge of himself, and in his career. Crazy Eights is the latest book in the series, and Jake's responsiblities at work, and in his personal life, have increased. Elizabeth spoke of Jake as representing everyman. And, in the next book, DNA will play a major part in crime and in Jake's search for knowledge of his own story. It was a pleasure to meet Elizabeth. She lives in Tucson, and is a small woman, not much taller than me. She wanted a hug, and then we spent time discussing mysteries - George Pelacanos, Dennis Lehane, Harlan Coben. She said we ought to get together for dinner sometime, and talk books. She was a fascinating speaker who does a great deal of research so that her books are accurate. Mary Anna Evans also does a great deal of research for her books. Saturday, Jim & I went to The Poisoned Pen in Scottsdale to see her again. She and James Sallis are both published by Poisoned Pen Press. Sallis has a novella out, Drive, that has been favorably reviewed by Marilyn Stasio in The New York Times, and a pick of the week by Entertainment Weekly. But Jim & I went to see Mary Anna. A few years ago in Ft. Myers, Mary Anna saved my schedule at the Lee County Reading Festival by agreeing to appear when Nancy Pickard had to cancel due to her mother's heart attack. Mary Anna came down from Gainesville, even though her first book, Artifacts, hadn't even been published yet. The audience enjoyed her, and I invited her back the next year when she could at least sell copies of Artifacts. Now her second book, Relics, is receiving good press. It brings back Faye Longchamp, who is now finishing up her degree to be an archeologist. Interestingly enough, Faye, like Jane Hines, is of mixed race. Mary Anna talked about running her books past an archeologist in Louisiana for accuracy. I'm looking forward to reading Relics. It was great to see Mary Anna again. We also met her daughter, Rachel, who is hoping to attend school at ASU. Jim enjoyed talking to her about Arizona and college while I was able to get my copy of Relics signed. I'm always pleased to see the authors from the Reading Festival, but particularly to see Mary Anna. I really appreciated her help. 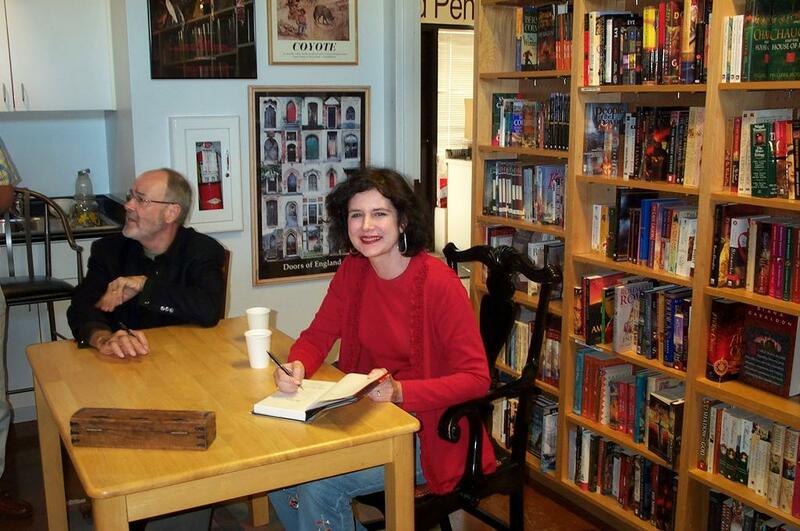 The attached photo is Mary Anna Evans and James Sallis at The Poisoned Pen 9/24/05. Straight into Darkness is the latest novel by Faye Kellerman. Although it has a mystery as its premise, the book itself is much more than the simple story of a homicide detective tracking a serial killer. Axel Berg is a homicide detective in Munich in the mid-1920s when someone kills women and leaves their bodies in a local park. He and his team try to uncover the secrets behind the deaths. At the same time, Kellerman is revealing the secrets behind Munich in the 20s. This was a scary time and place to live, even for a policeman like Berg. There is an unease in the air, born of the fear of the political climate. Kellerman describes it as, "Munich had been languishing in a terrible postwar flux. The war had been lost, lives had been demolished, the monarchy had been overthrown, and Russia was eagerly waiting to invade Bavaria." It was a time ripe for the rise of opposition political parties, including the Kommunists(spelling in book), the Social Democrats, and the Nazis. The scariest group was Hitler's Brownshirts, young men that the police such as Berg viewed as hooligans. Hitler is riling the people, and the police oppose that, but are forced to work with him. Berg is a man that questions authority, and opposes the rise of Hitler. He served in World War I, but questions "Germany's exaggerated sense of maleness and duty and willingness to die for the Fatherland - what propelled the country time and time again into war?" Berg's own career and life are on a tragic path, as he opposes his superiors, a killer, and the Nazi party. But, the greatest tragedy in the book itself is Germany's path to Naziism and war, what Kellerman calls the "national tragedy." I discovered a wonderful new character I hated to leave behind when I finished Donis Casey's first mystery, The Old Buzzard Had It Coming. Hopefully, this will be the first of many mysteries to feature Alafair Tucker, the matriarch of an Oklahoma farm family. Alafair is only 38, but as the strong, wise mother of nine, she certainly deserves to be called matriarch. And, she'll fight for her children, and those she feels deserves help. It's a nasty January day in 1912 when Harley Day dies. No one regrets the death of the drunk, abusive man, including Alafair, but when it's discovered that he was murdered, Alafair begins to worry. Everyone wanted him dead, but his son, John Lee, is a suspect. And, Alafair was just learning how much her seventeen year old daughter, Phoebe, cared for John Lee. Like a mother hen, Alafair is going to protect her daughter. If her daughter loves John Lee, there must be some good in him, so Alafair determines she'll find Harley Day's killer. Alafair Tucker makes a logical detective. She understands people, knows the people in this community, and has a great deal of common sense. As the mother of a large family, she should have a number of opportunities to solve problems. Casey also does a wonderful job with the details of day-to-day life in Oklahoma in 1912. Her description of wash day for a family of eleven shows the amount of work a farm woman did, just in one day. The entire book is filled with such descriptions of daily life. History, mystery and romance combine in this terrific first mystery. Check out Donis Casey's web site at www.doniscasey.com. Bouchercon 36, a major mystery convention, just ended in Chicago. Their web site at http://home.comcast.net/~bouchercon/2005/awards.html, listed all the awards won, and the nominees for those awards. I'm going to list winners, and those nominees of interest to me in each category. For any other nominees, check out Bouchercon's site. The Anthony Awards are given each year at Bouchercon, the award and conference named for Anthony Boucher. Nominees are suggested by fans and winners are chosen by a vote of registed convention attendees. The Barry Awards are given each year by Deadly Pleasures Magazine for the best crime fiction. The Shamus Awards - The Private Eye Writers of America honors the best "P.I." mysteries each year. Will Thomas' Some Danger Involved was also nominated. The Macavity Awards - Mystery Readers International give out this award, as voted by the members. J.A. Konrath's Whiskey Sour was also nominated.